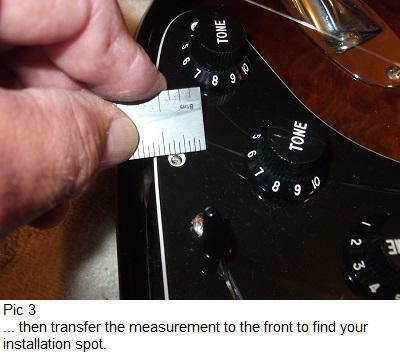 We’re going to modify a Strat for seven different pickup combinations in this post. This will work on any guitar with three pickups and a five-way selector switch. I saw this on one of the many guitar websites around the internet so it isn’t an original idea. 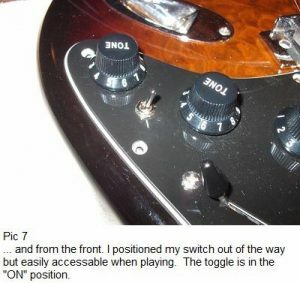 There are two ways to accomplish this: One is to add a simple mini-toggle switch to add the neck pickup in with the middle and bridge (the output is all 3 pickups – nothing special tonewise) or add the neck in with the bridge alone for a monster Strat tone (and it is, especially on an HSS Strat). The second way is to change out the volume pot to one that includes a push/pull or a push/push switch that accomplishes the same thing but has no outward appearance differences. The second is a little more complicated but not very hard to do. Drawing 1 is the simpler of the two methods. 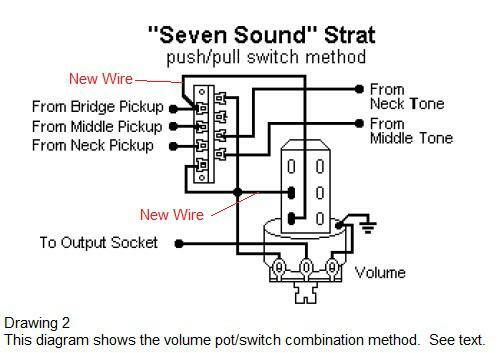 Now, the odds are that this diagram looks nothing like your guitar’s wiring – mine didn’t. Just find the output wire from the neck pickup where it attaches to the five-way selector. Connect a wire from that point to one side of your switch (it doesn’t matter which side). 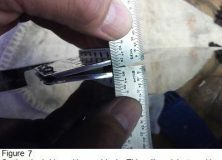 Now, find the wire from the five-way to the volume pot – connect your other wire on that terminal on the five-way. Run that wire to the other side of your switch… you’re done. 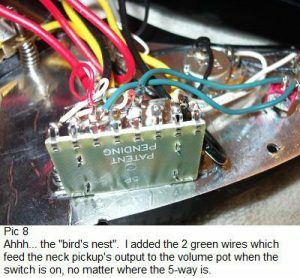 To double check… your wiring should take the output of the neck pickup and connect it to the volume pot (thus by-passing the five-way selector) when your new switch is on. 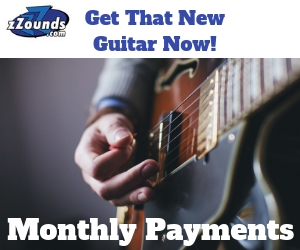 So, whenever your switch is on, you are running the neck pickup plus whatever pickups you have selected with the five-way. The only difference you will notice is when you have the five-way in the third position (middle only) It will be the same as the fourth position (neck and middle) with your switch on. The big changes come when you go to the second position (middle and bridge) where you’ll have all three pickups on, and in the the first position where you’ll get the Strat sound on steroids of the neck and bridge pickups on together. 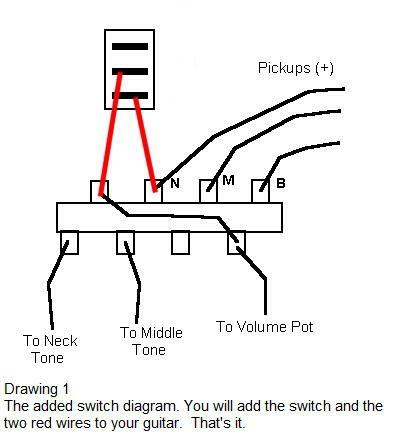 Drawing 2 shows the volume pot/switch combo. This diagram is a little more confusing and it reverses the five-way positions in that this diagram adds the bridge pickup to the fourth and fifth positions. Don’t ask me why. The outcome is the same but the big tone with be in the fifth (neck) position and all three pickups will be on position four. 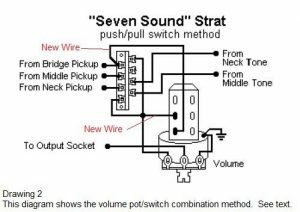 If you play a lot with the neck pickup, this wiring may be better for you in that you can just throw your switch to add the bridge pickup in for a solo, and flick it back off to go back to rhythm. You can pick either one for the switch addition by just using the bridge pickup’s output, instead of the neck, in the first drawing; or you can use the neck output in drawing 2. The tones will be the same but on opposite ends of the five-way. Your choice. 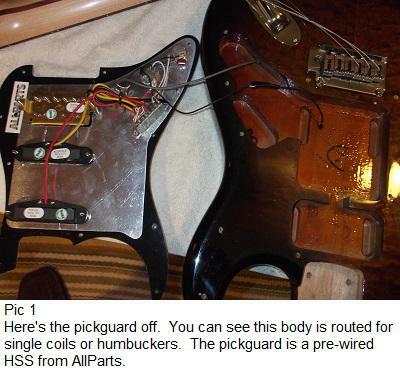 Pic 1 shows my pickguard off so I can locate where the rout runs in relation to the volume and tone pots. 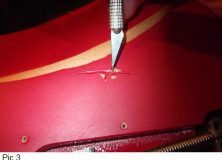 Measure where the edge of the route is in relation to an object you can find when the pickguard is in place. Now you can look at the front of the pickguard and choose your location for the switch where it will fit without interference from anything else it has to share space with. Pic 4 shows my switch. It’s just a simple on/off (SPST – Single Pole, Single Throw) switch. 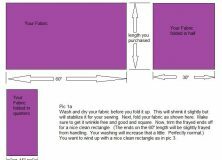 It’s pretty small and will fit just about anywhere in the pickguard where there is a route to allow it. 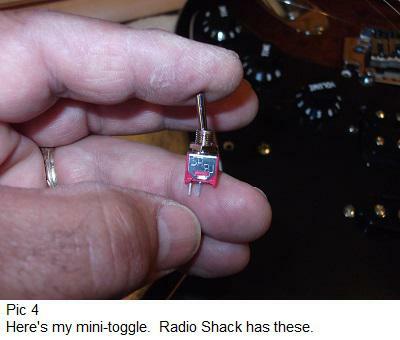 The toggle (handle) will point away from the terminals on the bottom in the ON position. That makes orientation easy. I slipped my switch in just below and between the tone pots, so it’s out of the way and won’t get turned on by accident, but is easy to hit when I want to. I installed mine so that ON is up, an easy motion to accomplish. You can see in pic 6 that there is plenty of room. 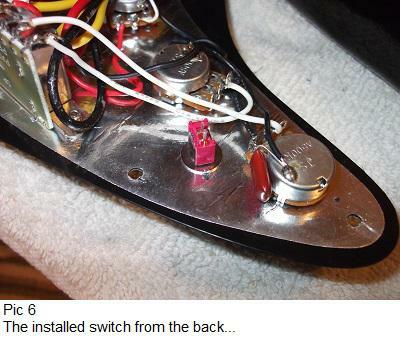 You can see in pic 7 that I still have plenty of room to run my pinky around the neck tone pot, even with the switch ON. Pic 8 is my five-way, which is not the same as my MIA Strat. 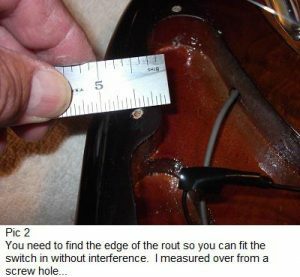 Just find the wire from the neck pickup (or the bridge) and the wire that goes from the five-way down to the volume pot. Connect your switch across those two terminals and you’re done. With the new switch OFF, the guitar is totally unaffected and your 5-way will work exactly as it always has. So all you did was adding those two green wires?